No. of Pages: 16 pgs. 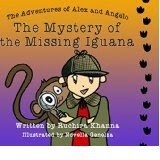 Ruchira Khanna has caught the imagination of the young minds. When I got this book by post, I felt good. The mailman barely brings me gifts, so the feeling was ...:D Thanks Ruchira. But it was short lived. It was addressed to my son. So, I felt a bit jealous (I think I just lost the role of Mother India !) and decided that the receiver of the gift should review this one. I read him the story first and then he read it after a few days. Once he got into the book, he was not happy sharing it with me. I have proof for that! Me: Yes. But what did you like most about this book? Me: Chimp. (I automatically corrected ) Why did you like it? Is he as naughty as you ? R: (promptly) No, He is as smart as me. Me: (Modesty, I tell you) Why do you think he is smart? Me: So what about the story? R: (giggling) Mamma, it is so funny. Especially the part when the Iguana won't leave the monkey's tail. Me: Chimp, sweetheart. Ok, what about Alex? Do you want to be like Alex? R: Yes. Mamma. He is so cooooool. Me. Really? What did you learn from Alex? R: (without batting an eyelid) You owe me more than one dollar! R: Yes. Alex taught me for every work to take 25 cents. Me: Oh Daddy is at home! Talk to you later sweety. R: Ma? Will Alex and Angelo have another adventure. The first thing about this book that attracted me was its illustrations. Very cute and positive. The story had an Enid Blyton quality and if turned into a series will really adorn the shelf of many kids. The words used are a mixture of easy and tough, so the kids will not only read the story on their own but would definitely learn new words. Highly recommended. The review and the interview were charming, Rubina! It sounds like a great book! Glad you liked it. We both had some enjoyable moments - thanks to you :) Hugs.. I like and love the review and interview of yours . I love Mr.R 's confidence in sharing his views about the book.